This research describes and implements new techniques for objective analysis and comparison of common time stretching algorithms. A set of test signals and samples is used in conjunction with spectral analysis to generate objective error measurements and subsequent comparisions of the algorithms. The time stretching techniques are treated as black-box processes, and are regarded as members within a general family of analyze-modify-resynthesize algorithms. This black-box approach of output signal analysis provides a basis for objective evaluation of the more general class of algorithms. Six common time stretching algorithms are analyzed: the classic phase vocoder, oscillator bank phase vocoder, peak tracking phase vocoder, phase-locked vocoder, synchronous overlap add technique, and overlap add technique. The six algorithms are then compared within a uniform framework to provide greater insight regarding the behavior of their output signals. Subjective listening evaluations are also performed, then all results contribute to the development of criteria that evaluate and rank the algorithms’ suitability in various signal processing situations. M.L.A. — Baker, Cooper Everett. Objective Analysis of Time Stretching Algorithms. Diss. University of California, San Diego, 2015. (Doctoral dissertation, University of California, San Diego). Chicago — Baker, Cooper Everett. Objective Analysis of Time Stretching Algorithms. In total, this research uses six test signals in conjunction with three analysis techniques to evaluate six time stretching algorithms. The techniques and algorithms are described in detail, and 128 different graphs representing the resultant data are interpreted and comparatively discussed. This particular example was selected to briefly illustrate a facet of the research and provide a general idea of what the work is about. 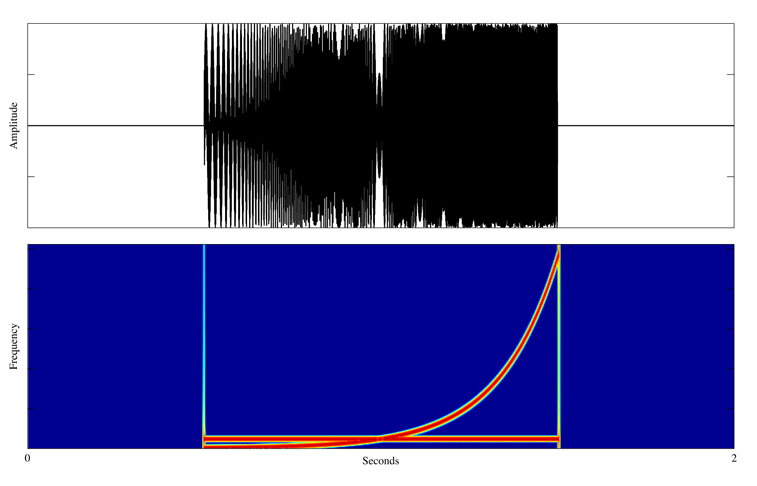 Analysis of the Phase-Locked Vocoder in this example is performed using one of the special test signals shown below. This test signal is designed to be difficult to stretch, and consists of a steady 1000 Hertz sinusoid mixed with a logarithmically swept sinusoid that moves from 50 to 21,000 Hertz. The input signal is synthesized with a duration of two seconds and an another ideal output signal is synthesized with a duration of four seconds. This allows comparison of the ideal output signal with the stretched output signal when the Phase-Locked Vocoder is configured to stretch its input by two times. The input, ideal, and stretched signals used in this example may be heard below. 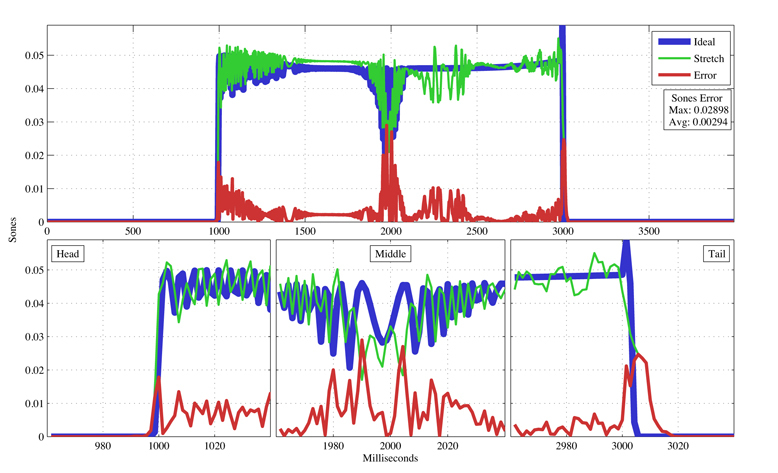 The following graphs show the ideal swept sinusoid signal in blue, the stretched version in green, and the error, or absolute difference, in red. Error is scaled in sones on the Y axis to more closely match our perception of sound, and the X axis displays the ideal and stretched signals over time, while also providing a more analytical representation of their differences than our ears can perceive. The upper graph is an overview of the entire signals, and the lower graphs show more detailed views of interesting areas within the signals.